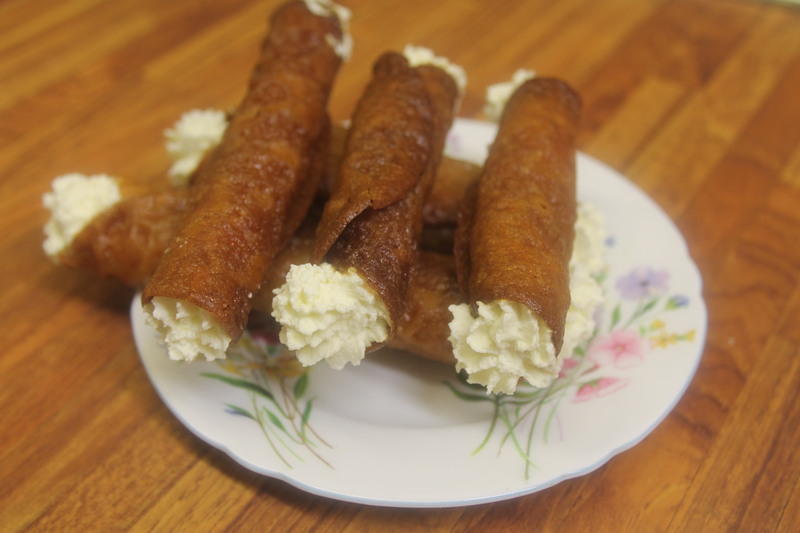 Brandy snaps look really impressive but are not that difficult to make, not easy peasy but not hard! Heat the oven to 180 C, 350 F or gas mark 4, grease a baking tray and the handle of a wooden spoon. Melt the butter sugar and syrup in a saucepan or in a bowl and into the microwave. Remove from the heat and stir in the remaining ingredients, beat well. Put small spoonfuls of the mixture at least 3 inches apart on the baking tray and bake for 7-10 mins. Bake in small batches I put four drops on each tray, they spread out. Allow each batch to cool slightly and always have the next batch ready to go when one comes out. Roll each one around the handle of a greased wooden spoon, remove the spoon and leave the biscuit on a wire tray. Do not try and roll too soon, if the mixture is too soft it will not hold the shape of the wooden spoon. If the biscuit is too cool and set you will not be able to roll without it cracking, so re-heat a little more in the oven to soften and try again. Keep going until all the mixture has been used. When completely cold pipe fresh cream into both ends and serve immediately. These biscuit will keep for quite a while in an air-tight tin and then just piping the cream before you serve. If you roll when the biscuit are too hot you will get a slump! © Online Stores, Inc., and The English Tea Store Blog, 2009-2015. Unauthorized use and/or duplication of this material without express and written permission from the blog’s owner is strictly prohibited. Excerpts and links may be used, provided that full and clear credit is given to Online Stores, Inc., and The English Tea Store Blog with appropriate and specific direction to the original content.